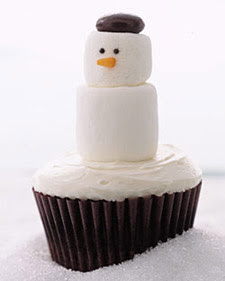 I just had to share these adorable cupcakes I found via The Finer Things blog... Martha really does think of everything! people are so creative with cupcakes, they really are. i love it. awwwwwwwwww just look at that!i wouldn't be able to eat it, it's so adorable! so cute! too cute to get eaten I'd say! That is so cute... I'm imagining myself taking a bite... and I'm guessing it's a chocolate cupcake which I love. I'll save the marshmallows for last. Hmmmmmm.... yummy! That is adorable! Too good to eat, that's for sure! Adorable! I love making creative cupcakes for the holidays - thanks for sharing this cute idea! i love it! thanks for sharing this:) i'll have to check out her blog. So cute! I can't wait to start baking some yummy treats. Tis the season. can you find me a cute thanksgiving themed cupcake? (one that i would be able to handle...) we are doing gobble fest in my class on wednesday and i want to impress everyone with my cupcake decorating skills. i found a couple, but i have a feeling you can find cuter. thanks love you! Cupcakes have really come along way havent they hahaha..yummmmm! oh that's really cool. Unfortunately Austria's not exactly the homebase of cupcakes. I'd love to eat one like this. Is it just me or do cupcakes get cuter and cuter every year? ?